This weekend features a full set of matches for week 29 in the Premier League. The past week has seen odd sets of matches due to obligations in the League and FA Cups. Following this we have returned to the regular schedule of ten EPL games over three days. Following the last week and a half of Premier League matches the EPL table is starting to shake out and certain teams are showing what they are made of. I had previously thought that West Ham United would return to form, but have now gone undefeated in their last six EPL matches. With an away trip to Arsenal, I see little chance of them turning this around any time soon. They aren’t relegation fodder at this point, but could certainly free fall to the bottom half of the table. Speaking of free fall, Sunderland host the (somewhat) resurgent Aston Villa in a classic six-pointer. A Villa win would put them two points above the Black Cats and heading in the direction of safety while it would also mean Sunderland could creep every closer to relegation, depending on what other teams do. Leicester City and Hull City are another six pointer in which both teams will be desperate for much needed points. I’m predicting a scoring draw, but this could be a classic match that goes either way. A the top of the table I’m predicting wins for the top three to maintain the status quo. Liverpool should be able to get yet another win away to Swansea and could even move themselves up into fourth place. With Manchester United hosting Tottenham Hotspur there is a definite feel of desperation sinking in at Old Trafford. This is one match in a string of massive games against top six teams over the next month and is a must win for the Red Devils. Spurs last two wins proved that they have not given up on the Premier League season even after losing out in the Europa League and Capital One Cup. I’m predicting a scoring draw here, but again, this really could go either way, especially depending on what United does follow the disappointment on Monday. 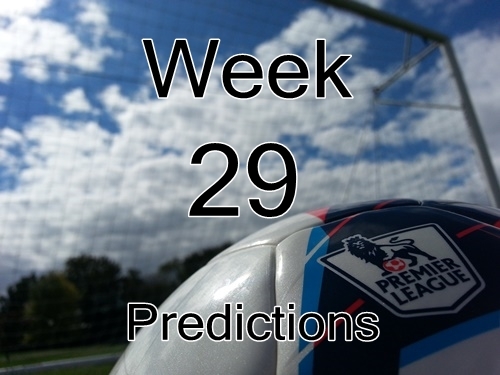 That more or less wraps up this week’s set of previews, picks, and predictions for week 29 in the Premier League. As always, feel free to leave your own predictions below or via twitter. In addition please stay tuned for a Premier Soccer Chat FPL weekly fantasy league coming soon at Togga. This will be open for all readers of Premier Soccer Chat and I’m really looking forward to getting at least one of these leagues going soon!